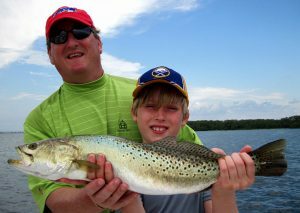 Charter fishing for sea-trout in Tampa/St. 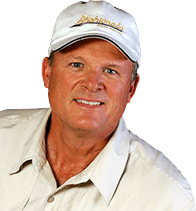 Petersburg with Captain Wade Osborne is productive year-round. However, during Florida’s cooler months sea-trout converge in deep-water grass flats and canals for their pre-spawn ritual. If you’re looking for shear numbers of fish in the two-pound range, this is best time of year. 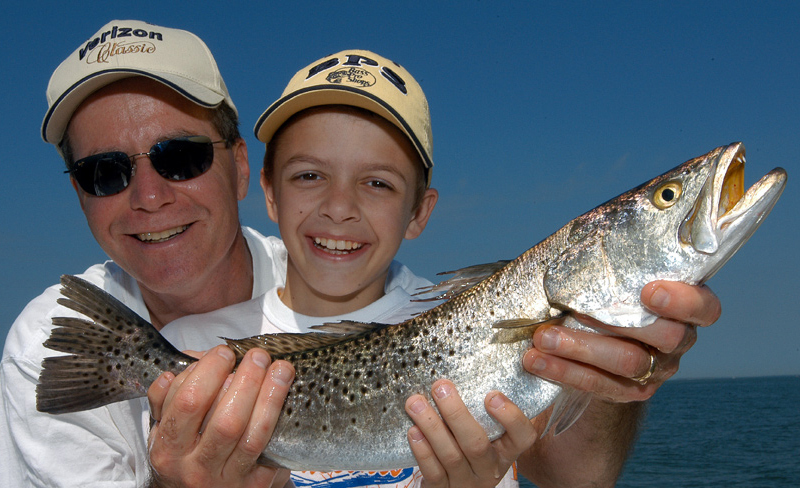 Some sea-trout in the three to four-pound range, frequently called “yellow-mouths” are caught regularly then also. Drift fishing is often the most productive. By drifting lush grass flats while working a jig or fly, it’s easy to locate schools of sea-trout. Once a school is located, circling the area repeatedly can yield 30-60 fish an outing just by using artificial baits. Another method is to anchor the boat and use live shrimp or scaled sardines. This technique usually produces the largest sea-trout. During the rest of the year, Osborne fishes deep grass flats and grass patches in Tampa Bay or that line the some of the passes along St. Petersburg’s coast. 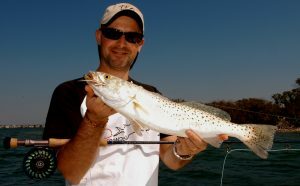 As the waters warm, sea-trout move into areas with a good tidal flow to stay cool and ambush bait-fish. Scaled sardines and small pinfish become the live bait of choice; however, flies and lures still catch plenty of fish. 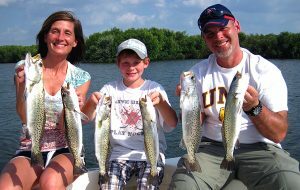 Sea-trout charter fishing is consistent year-round and is a great species to catch while introducing children to fishing. Long cast are not required and with the constant action these fish provide, young anglers develop a passion for the sport right away. Four fish per person, per day. 15 to 20 inches, one fish may be over 20 inches.